YOUR NEW CAR rolled into your life with the latest innovations in design and construction. But it still has to battle the wear and tear of our harsh Canadian climate. Strong UV rays, extreme heat or cold, snow and ice, rain or humidity, road salt and pollutants can harm your car's beauty and its functions. 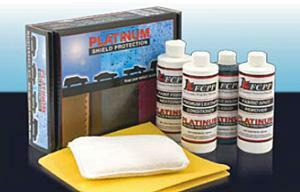 Exterior and interior safeguards from Platinum Shield Protection will defend your vehicle against harsh conditions.